Pre-heat the oven to 180C/350F/GM4. Grease the cake pop mould with dairyfree spread. Mix the vinegar and soya milk together with a fork, leave while you make the rest of the cake mixture (about 10 mins) - it should curdle. In a large bowl, fully mix together the flour, caster sugar, salt, baking powder, and bicarbonate of soda with a wooden spoon. Give the milk and vinegar a mix, and add it to the dry ingredients, then add the oil, vanilla extract, and mint extract. Quickly mix everything together for about 10 secs (don't worry if it's still lumpy). Spoon the mixture into the bottom half of the cake pop mould (about 3/4 full), then tap the tray on the side to make the bubbles pop (to slow the rising agents from working too quickly). Put in the oven for about 15 mins. Place a glass mixing bowl or measuring jug in a pan, pour boiling water into the pan, ensuring it doesn't go in the glass bowl/jug, until it fills to about half way up the glass bowl/jug. Break the chocolate up into small pieces (the smaller the pieces, the quicker it'll melt). Keep stirring the chocolate until it is fully melted. If you are using white chocolate, you can add some orange food colouring paste now to create orange chocolate. Dairyfree chocolate isn't usually as runny as normal chocolate, so I found it was easier to drop one of the cake balls into the melted chocolate, and then move it around until it is completely covered in chocolate. 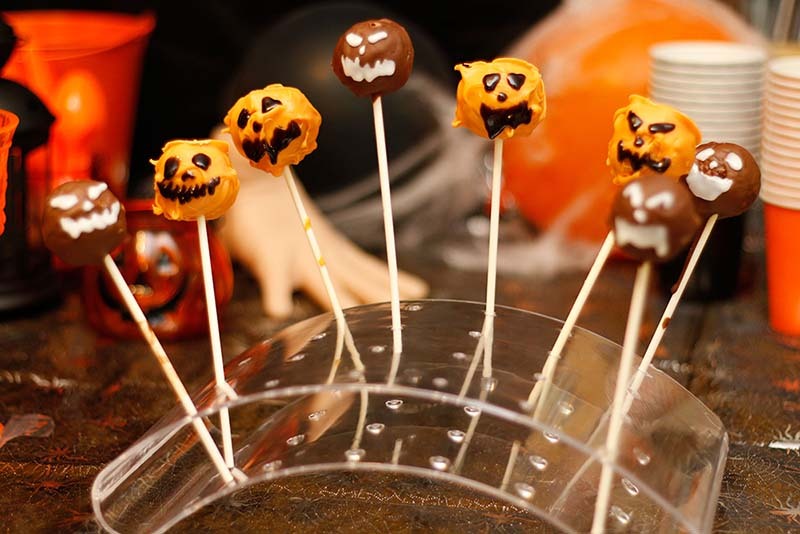 Using a cake pop stick, stab the chocolatey cake ball and take it out of the melted chocolate. Put the stick in a cake pop stand and allow to cool. Once all the cake pops have been coated, place the whole stand in the fridge to set the chocolate completely. Once set, remove from the fridge, and use the writing icing/gel to add final touches. These look great for Halloween! It's always a nightmare finding goodies for the kids that are vegan. I will definitely try these! They look yummy!